The addition to the Thompson Street Parking Structure is an integral part of the University’s Parking and Transportation strategic plan to provide parking for anticipated incremental growth in demand, and to replace parking lost on central campus due to various construction projects, including Joan and Sanford Weill Hall and the Perry Building addition. The project involves a 365-space parking structure addition to the west side of the Thompson Street Parking Structure, and 9,000 gross square feet of office and support space for the departments of Parking and Transportation Servicesand the Office of Budget and Planning. The existing structure and parking lots within the development zone currently provide 776 parking spaces. 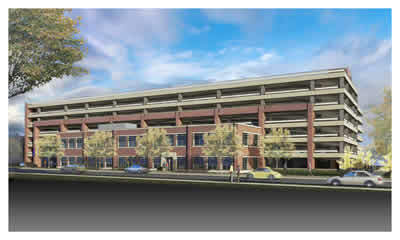 When construction is complete, the structure will accommodate 1,049 vehicles, for a net increase of 273 parking spaces. The estimated cost of the project is $15,700,000.